The Green Skeptic: Our Climate War: FRONTLINE's "Climate of Doubt"
We're in the midst of an uncivil "Climate War" that pits Climate of Fear vs. Climate of Doubt. 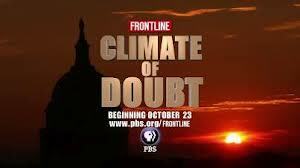 Last night I watched a program called "Climate of Doubt," FRONTLINE's hour-long take on the influences and influencers who have reshaped the climate change debate over the past five years. It was decidedly one-sided, unfortunately, and painted the skeptics and questioners with the same brush as the tobacco lobby and other malcontents. I believe the climate is changing, I've seen it with my own two eyes in places as far afield as Alaska, Indonesia, and even the northeast where I live. But I also believe that skepticism is a hallmark of human nature and it should be applied in liberal (pardon the usage) doses to every human endeavor, whether business, environmental or intellectual. Skepticism is also a healthy part of the scientific method as hypotheses are formulated, tested, and modified. 4.) There is huge potential investment opportunity in affordable solutions that may actually encourage prosperity not prevent it. Now, back to my earlier comment about questioning. The folks who are questioning the consensus of opinion or the validity of the science are neither necessarily wrong nor right. They may be looking at the data in ways that back up their arguments as much as anyone else who wants to prove a point. They may also be trying to deliberately confuse people about the issue, as the FRONTLINE program suggests, to create just such a climate of doubt. Of course, as journalist John Hockenberry asked one of his interviewees last night, "What if you're wrong?" The question could be asked about either side. Frankly, we won't know who is wrong or right until it's too late. What really troubles me about the FRONTLINE program last night is that we've lost all foundation for rational, reasonable debate in this country. We have become a nation of blamers and attackers. Anything we don't agree with is shouted down rather than reasonably argued against. It happens on both sides of the issue and good people are getting hurt in the process. There is a difference between passion and zeal, and we've lost sight of that difference. We need to get back to rational, reasonable dialogue and a healthy skepticism and away from attack ads, smear campaigns, and trying to prove who is right. We need to meet in the middle and develop cost-effective solutions to mitigate the impacts of even the most modest scenarios and, perhaps we'll end up promoting prosperity while insuring we're around to enjoy it. We need to take a chill pill and create a climate of collaboration and put an end to this climate war.